Caucasian White Valentine Girl card or poster drawn in anime style depicting hearts dots and lace. Anime girl holds large red heart between both hands just at the chest level. She is also surrounded by several white hearts as well as a slew of star-like polka dots. The art gives the impression that the girl could be standing in a pink sky surrounded by fluffy white heart clouds and delicate dotted stars. Hearts even adorn the anime girl’s shoes and dress. Additionally she wears a tiny heart necklace that sits discreetly beneath her chin. Hearts and ribbon adorn her hair along with ribbon and lace at the hem of her dress. White lace surrounds the red heart in her hands akin to that adorning the dress bodice. Anime Valentine girl’s eyes are large with pink highlights. This artwork is available in two forms – card and poster prints – as laid out below. 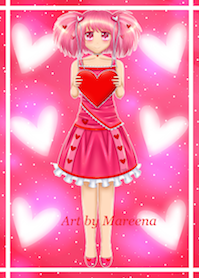 Mareena created this piece because her mom needed a Valentine’s Day card featuring a girl. She wanted the card to be original and unique. While crafting the card, Mareena used a drawing technique that allowed her to make the hair look realistic and shiny with detailed strands as opposed to a mere clump of hair. This card is also available in an African American Black girl version. You can adorn rooms with this beautiful piece or send it in card form.